Posted on December 20, 2011	by Lou Murray, Ph.D.
Can’t believe I haven’t made a post since Nov. 22. Well, no time to catch up now. Christmas craziness, you know? I’m just adding in this week’s harvest. No time for photos of my harvests. No time to add in the past three weeks either. Oh well. The three raised beds in my home garden are looking pretty good for December. At least the nice wooden bed borders are down in my community garden plot. Had to remove them by Dec. 31. I’ll worry about putting up cheap plastic edging later. The hens are nearly finished with their molt. Good thing, because we haven't had any eggs from them in two months. 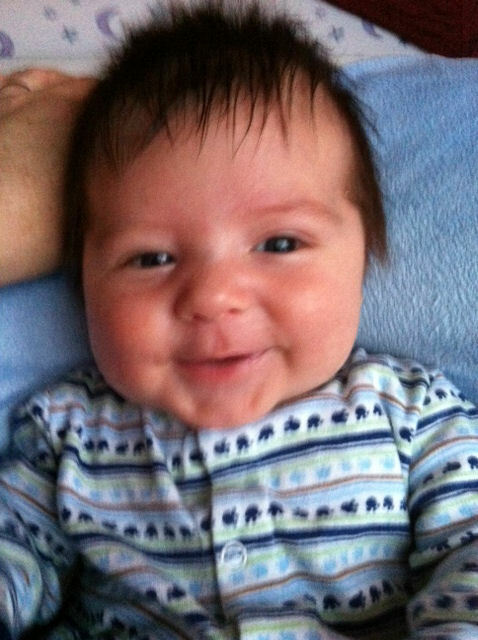 Our grandson baby Mike at two months. What a cutie! I can hardly wait to share our garden with baby Mike. His older sisters love helping me harvest. TOTAL PRODUCE 3 lbs, 0.5 oz, and no eggs since end of Oct.
Be sure to drop by Daphne’s Dandelions to see what others are harvesting this time of year. Have a very Merry Christmas, and best wishes from my garden to yours for a prosperous and bountiful 2012. 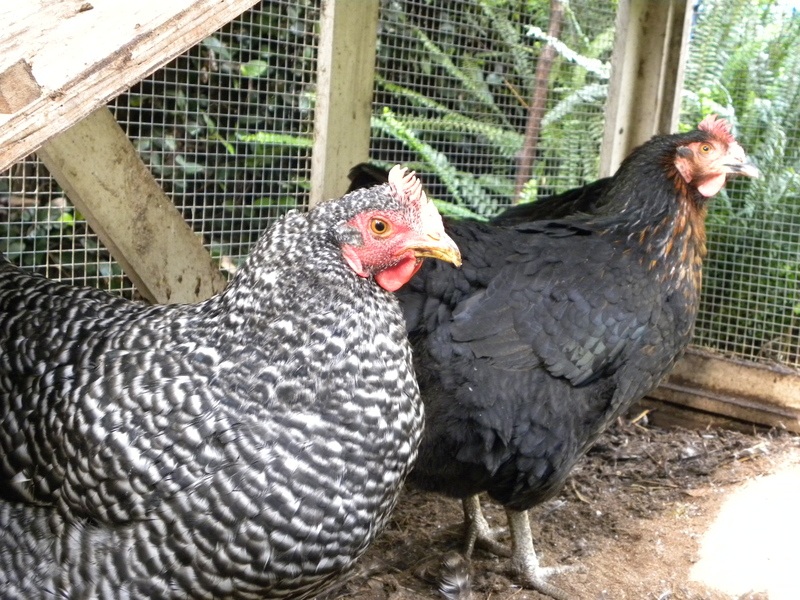 This entry was posted in Uncategorized and tagged Harvest Monday, hens, vegetable garden. Bookmark the permalink. And a Merry Christmas to you. Happy harvesting in the new year. Thanks, Ottawa. Same to you. Your grandson is sooooo cute. Such a charming smile, I had to smile back. Your home garden is still so bountiful. Hope your hens are producing for you. Thanks, Norma. No, the chickens still aren’t laying. Soon I hope now that we’ve passed the winter solstice and they have completed their molts. 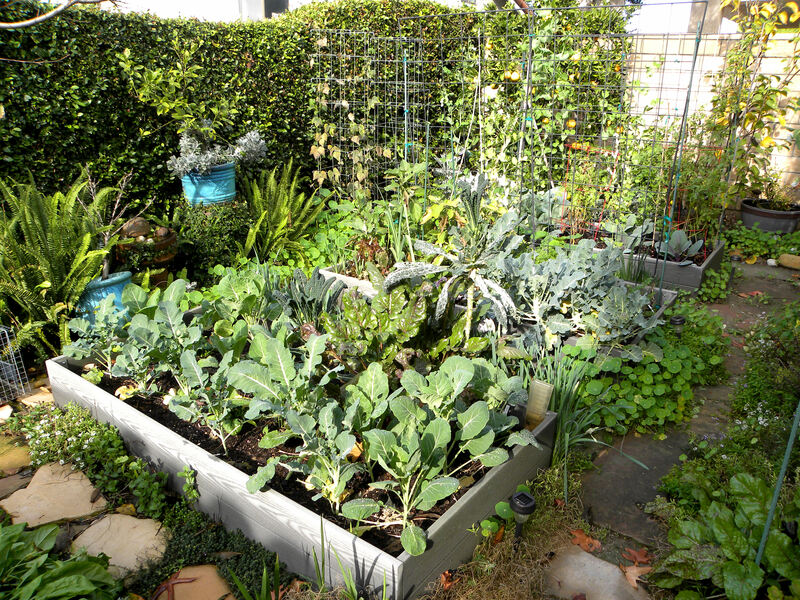 You are getting a really nice harvest from your winter garden and the beds look healthy and happy. It really is a hectic time of year but luckily the gardens are slowed way down and are content to see us when we have a moment to spare. Kitsapfg, Thanks. I too appreciated the slower pace of my winter garden. That’s pretty good for a December garden! Our freezes recently have put to stop to most things growing much…except maybe the Mizuna, but I don’t think much slows that 😛 Hopefully, with the shortest day of the year just around the corner, and our hens with their new suits of feathers, the eggs will start rolling in again. This is the only time of year when I don’t have a surplus of eggs in the fridge (and yet it’s the time of year I need them the most for baking!)…. Clare, aren’t our chickens inconsiderate? Don’t they understand that we like to bake in winter and need eggs for that? My girls are putting up quite a racket, and I had hoped that one was laying, but they just seem to want some fresh greens. Barbie, extra eggs–or ANY eggs–are a dream right now. My hens are calling me to get some fresh greens for them, but they aren’t laying. He is a cutie! And your harvest is looking good too. Sometimes those in warmer climate, but then sometimes I really love having a winter break. I think that everything said was actuall very logical. a picture or twoo to get readers excited about everything’ve goot to say. In my opinion, it would bring your websit a little livelier.